366 pages | 62 B/W Illus. Opioids such as morphine, codeine, and oxycodone are extracts or analogs isolated from a single source: the opium poppy. For a long time, it was believed to be nature’s only source of opioids. But it now appears that biological diversity has evolved an alternative source of opioid compounds—those derived from the plant Mitragyna speciosa. This plant, known as Kratom in Thailand or Biak-Biak in Malaysia, has long been used locally as treatment for pain, fever reduction, diarrhea, and even depression. Kratom and Other Mitragynines: The Chemistry and Pharmacology of Opioids from a Non-Opium Source presents an introduction to the chemical and biological properties of alkaloids isolated from M. speciosa as well as their synthetic analogs. The book covers various topics including phytochemistry, medicinal chemistry, and pharmacology. Current research, analgesic effects, and addiction potential are also discussed. As the first extensive text on the basic science and clinical use of Kratom, the book provides readers with a concise yet comprehensive introduction to nature’s "other opioid." 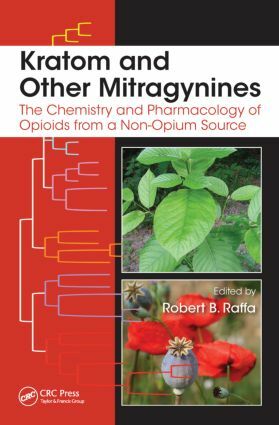 "This is a novel foray into the realm of reviews on non-poppy-derived opioids and their pharmacology and … provides very solid information about the chemistry of the mitragynines…The editor, Robert Raffa, is a widely known expert in the pharmacology of opioid drugs with significant knowledge and respect in the field." "This book should be an indispensable single-volume information source for anyone working in the fields of opioid chemistry, pharmacology and toxicology. Some chapters would be of particular interest to … specialists working in addiction treatment and drug regulation. The book would also be an excellent addition to any library collection specialized in natural products or drugs of abuse." Opioid-Induced Adverse Effects and Toxicity; Joseph V. Pergolizzi, Jr.
Robert B. Raffa is a professor of pharmacology in the Department of Pharmaceutical Sciences at Temple University School of Pharmacy as well as a research professor in the Department of Pharmacology at Temple University School of Medicine. He has bachelor’s degrees in chemical engineering and in physiological psychology, master’s degrees in biomedical engineering and toxicology, and a doctorate in pharmacology. Dr. Raffa was co-leader for analgesics discovery at Johnson & Johnson and was pivotal in the elucidation of the mechanism of action and development of the analgesic drug tramadol (Ultram™). He is the co-holder of several patents, including the combination of tramadol plus acetaminophen (Ultracet™). He has published more than 280 scientific articles in peer-reviewd journals and is the co-author or editor of several books.